Bonus match (to add a second week of TV.) Apache threw a drink in Venum’s face to set up Super Fly’s German suplex. Toluca was completely packed, as it often it. This should be a fun taping to watch. Pentagon’s win puts him in the Rey de Reyes final, where he’s about 20 years younger than anyone else in the match. In an ideal world, the idea of putting Blue Demon, La Parka and Villano IV is justified by Pentagon beating all three to make him as a top guy. That’s not going to happen, Blue Demon isn’t losing clean. In the best world that’s possible, Pentagon Jr. beats La Parka after Demon & Villano IV brawl outside for the annual Rey de Reyes double countout – this final still kind of works. The problem is, if we believe what we’re told, there’s no particular reason to have faith in that happening – they’ve got a new system for booking the shows that’s all of three months old, AAA doesn’t have the track record of doing that sort of thing right now. Really, whatever happens with Pentagon in Rey de Reyes, the important part is doing something important with him coming out of it. A luchador’s place in the ongoing narrative matters more than any individual win – look at Taurus, who’s essentially in the same midcard place he would’ve been if he just debuted on a random TV taping. I want Pentagon Jr. to win Rey de Reyes, but I’d more like AAA to have an important match for him in mind for TripleMania. Which is why the debut of Octagon Jr. is kind of a double edged sword. It’s great to see Flamita get a character that expresses a strong commitment from AAA. (He’s probably not going back to Dragon Gate.) The importance of the Octagon name – in emotional, marketing and legal terms – means he’s probably going to get moved up a little bit. Flamita/Pentagon matches sound awesome. However, if they’re doing it in the third match, then it feels like a under valuation of both guys. I hope they both take each other to the main events, but I’m concerned this might slot them both together in the midcard. Octagon Jr. and Fantasma are both now off Rey de Reyes. It’s possible one or both could be off because they’re needed in LA for Lucha Underground taping before the material, or that Octagon Jr. is going to be the surprise luchador in the opener. Slotting your new big character in the opener doesn’t seem to do much for him. 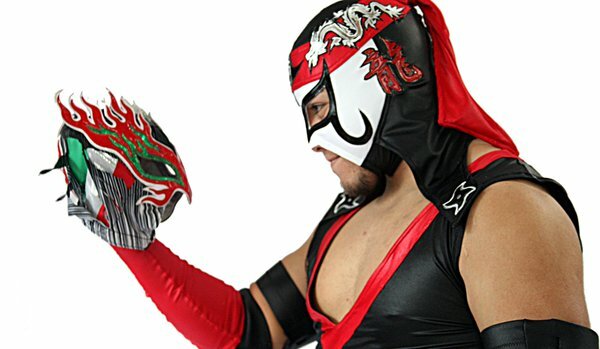 What I’d really like to see is Octagon Jr. facing Hijo del Fantasma for the Cruiserweight championship. It’s be a great match on a card that could always use a great match, Octagon could make an impact with a big win right away, and Fantasma could be freed up to go after the heavyweight championship should Mesias win. I don’t expect this to happen. Octagon reacted angrily to the news of an Octagon Jr., saying he didn’t give permission and promoters should not use him. Octagon’s lawsuit over the name has gone nowhere since announcing it in late 2014, and it’s unlikely his objections will amount to anything more than angry rants on social media. Venum and Apache had issues on the last taping as well, so I guess they’ve got a long term plan for that feud. Next taping is 03/11 in Naucalpan.